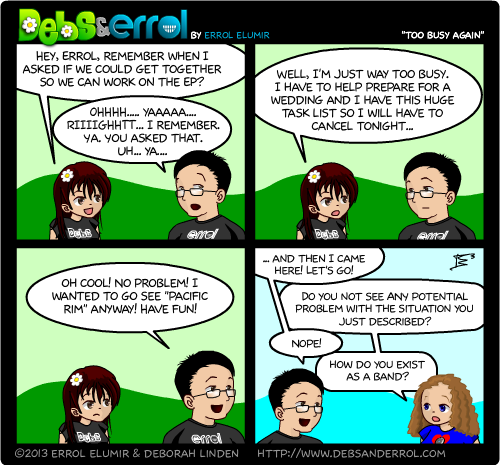 Errol: Debs always fills up her schedule to the point of super saturation! And today she’s off recording! People think I see Debs all the time, but that’s not true, actually. Debs: Super saturation couldn’t be avoided. Practicing for the studio had to be done and bachelorette (and not a wedding) this weekend has to be planned. But it will be a bachelorette with a relaxation component involving a beach, thank goodness. Whitless: Pacific Rim had a few cliches and plot holes but I wasn’t paying attention to them because ROBOTS WERE PUNCHING GIANT LIZARDS! It was awesome. Seriously awesome. And you know what? That stupid Adam Sandler movie beat it at the box office! HOW?! HOW DOES A CRAPPY ADAM SANDLER SEQUEL BEAT GIANT ROBOTS PUNCHING GIANT LIZARDS?! HOW DOES ANY MOVIE FOR THAT MATTER?! Clearly it is a dark time. I was told to go see that. Not sure if I’ll get a chance to, though. Did get to see MU and DM2, though. Still ticked I missed Trek. Not sure what I’m looking forward to next. Really, because my camp counselor just not me not to see the movie because it sucked.